Shoko Asahara (麻原 彰晃, Asahara Shōkō, March 2, 1955 – July 6, 2018), born Chizuo Matsumoto (松本 智津夫, Matsumoto Chizuo), was the founder of the Japanese doomsday-cult group Aum Shinrikyo. Asahara was convicted of masterminding the deadly 1995 sarin-gas attack on the Tokyo subway, and was also involved in several other crimes. He was sentenced to death in 2004. In June 2012, his execution was postponed due to further arrests of Aum Shinrikyo members. He was executed by hanging on July 6, 2018. Asahara was born on March 2, 1955 into a large, poor family of tatami-mat-makers in Japan's Kumamoto Prefecture. He had infantile glaucoma from birth, which made him lose all sight in his left eye and go partially blind in his right eye at a young age, and was thus enrolled in a school for the blind. Asahara was known to be a bully at the school, taking advantage of the other students by beating them and extorting money from them. He graduated in 1977 and turned to the study of acupuncture and traditional Chinese medicine, which were common careers for the blind in Japan. He married the following year and eventually fathered 12 children, the eldest of whom was born in 1978. In 1981, Asahara was convicted of practicing pharmacy without a license and selling unregulated drugs, for which he was fined ¥200,000 (equivalent to about ¥245,000 in 2013). Asahara's interest in religion reportedly started at this time. Having been recently married, he worked to support his large and growing family. He dedicated his free time to the study of various religious concepts, starting with Chinese astrology and Taoism. Later, Asahara practiced western esotericism, yoga, meditation, esoteric Buddhism, and esoteric Christianity. In 1984, Asahara formed Aum Shinsen no Kai. He changed his name from Chizuo Matsumoto to Shoko Asahara and renamed his group Aum Shinrikyo in 1987. Asahara applied for government registration and, although authorities were initially reluctant, after an appeal, the Tokyo Metropolitan Government eventually granted it legal recognition as a religious corporation in 1989. After this, a monastic order was established, and many lay followers joined. Asahara gained credibility by appearing on TV and on magazine covers. He gradually attained a following of believers and began being invited to lecture-meeting at universities. Asahara also wrote several religious books, including Beyond Life and Death, Declaring Myself the Christ, and Supreme Initiation. The doctrine of Aum Shinrikyo is based on the Vajrayana scriptures, the Bible, and other texts. In 1992 Asahara published Declaring Myself the Christ, within which he declared himself Christ, Japan's only fully enlightened master, and identified with the Lamb of God. His purported mission was to take others' sins upon himself, and he claimed he could transfer spiritual power to his followers. He saw dark conspiracies everywhere, promulgated by the Jews, the Freemasons, the Dutch, the British Royal Family, and rival Japanese religions. He outlined a doomsday prophecy, which included a third World War, and described a final conflict culminating in a nuclear "Armageddon", borrowing the term from the Book of Revelation 16:16. Asahara often preached the necessity of Armageddon for "human relief". He eventually declared, "Put tantra Vajrayana into practice in accordance with the doctrines of Mahamudra," and he led a series of terrorist attacks using a secret organization hidden from ordinary believers. On March 20, 1995, members of Aum Shinrikyo attacked the Tokyo subway with the nerve agent sarin. Thirteen people died and thousands more suffered ill effects. After finding sufficient evidence, authorities accused Aum Shinrikyo of complicity in the attack, as well as in a number of smaller-scale incidents. Dozens of disciples were arrested, Aum's facilities were raided, and the court issued an order for Asahara's arrest. On May 16, 1995, the police investigated the headquarters of Aum Shinrikyo. Asahara was discovered in a very small, isolated room in one of the facilities. Wary of possible Aum military power, the First Airborne Brigade of the Japan Ground Self-Defense Force was stationed nearby to support the police if needed. Asahara faced 27 counts of murder in 13 separate indictments. The prosecution argued that Asahara gave orders to attack the Tokyo Subway in order to "overthrow the government and install himself in the position of Emperor of Japan". Later, during the trial which took more than seven years to conclude, the prosecution forwarded an additional theory that the attacks were ordered to divert police attention away from Aum. The prosecution also accused Asahara of masterminding the Matsumoto incident and the Sakamoto family murder. According to Asahara's defense team, a group of senior followers initiated the atrocities and kept them a secret from Asahara. During the trials, some of the disciples testified against Asahara, and he was found guilty on 13 of 17 charges, including the Sakamoto family murder; four charges were dropped. On February 27, 2004, he was sentenced to death by hanging. The trial was called the "trial of the century" by the Japanese media. Meanwhile, Asahara resigned from his position as the Aum Shinrikyo representative in an attempt to prevent the group from being forcefully dissolved by the state. The defense appealed Asahara's sentencing on the grounds that he was mentally unfit, and psychiatric examinations were undertaken. During much of the trials, Asahara remained silent or only muttered to himself. However, he communicated with the staff at his detention facility, which convinced the examiner that Asahara was maintaining his silence out of free will. Owing to his lawyers' failure to submit the statement of reason for appeal, the Tokyo High Court decided on March 27, 2006, not to grant them leave to appeal. This decision was upheld by the Supreme Court of Japan on September 15, 2006. Two re-trial appeals were declined by the appellate court. In June 2012, Asahara's execution was postponed due to arrests of several fugitive Aum Shinrikyo members. Asahara was executed by hanging on July 6, 2018, at the Tokyo Detention House, 23 years after the sarin gas attack, along with six other cult members. Relatives of victims said they approved of the execution. ^ "Japanese Aum Shinrikyo Cult Leader Shoko Asahara Executed". The Inquisitr. July 6, 2018. Retrieved July 9, 2018. ^ a b "Execution of Aum founder likely postponed". asiaone News. The Yomiuri Shimbun/Asia News Network. June 5, 2012. Archived from the original on February 23, 2014. ^ a b "Aum Shinrikyo: Japan executes cult leader Shoko Asahara". BBC News. July 6, 2018. ^ a b "Aum Shinrikyo guru Shoko Asahara hanged for mass murder: reports". The Japan Times. July 6, 2018. ^ a b "Key events related to Aum Shinrikyo cult". The Japan Times Online. July 6, 2018. ISSN 0447-5763. Retrieved July 7, 2018. ^ a b Atkins, Stephen E. (2004). Encyclopedia of Modern Worldwide Extremists and Extremist Groups. Greenwood Publishing Group. p. 27. ISBN 978-0-313-32485-7. ^ Holley, David (March 27, 1995). "Japanese Guru – A Youthful Bully's Quest for Power". Los Angeles Times. ISSN 0458-3035. Retrieved July 7, 2018. ^ Dharmananda, Subhuti. "Japanese Acupuncture: Blind Acupuncturists, Insertion Tubes, Abdominal Diagnosis, and the Benten Goddess". Institute for Traditional Medicine. Retrieved July 23, 2009. ^ Sims, Calvin. "Hard Legacy for Japan Sect Leader's Family". Retrieved July 6, 2018. ^ Drozdek, Boris; John P. Wilson (2007). Voices of Trauma: Treating Psychological Trauma Across Cultures. Springer Science. p. 61. ISBN 978-0-387-69794-9. ^ Métraux, Daniel Alfred (1999). Aum Shinrikyo and Japanese youth. University Press of America. p. 11. ISBN 978-0-7618-1417-7. ^ Lewis, James R.; Jesper Aagaard Petersen (2005). Controversial New Religions. Oxford University Press. p. 165. ISBN 978-0-19-515683-6. ^ Wudunn, Nicholas D. Kristof With Sheryl. "A Guru's Journey -- A special report. ; The Seer Among the Blind: Japanese Sect Leader's Rise". Retrieved July 9, 2018. 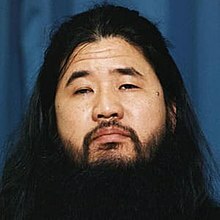 ^ "Shoko Asahara". Biography. Retrieved July 6, 2018. ^ "Shoko Asahara: From poor upbringing to cult leader". The Japan Times Online. July 6, 2018. ISSN 0447-5763. Retrieved July 9, 2018. ^ a b Metraux, Daniel A. (1995). "Religious Terrorism in Japan: The Fatal Appeal of Aum Shinrikyo". Asian Survey. 35 (12): 1147. doi:10.2307/2645835. JSTOR 2645835. ^ Asahara, Shōkō (1993). Beyond Life and Death. Aum Publishing Company. ISBN 9784871420723. ^ Asahara, Shōkō (1992). Declaring Myself the Christ: Disclosing the True Meanings of Jesus Christ's Gospel. Aum Publishing Company. ISBN 9784871420150. ^ Asahara, Shōkō (1988). Supreme Initiation: An Empirical Spiritual Science for the Supreme Truth. AUM USA Company. ISBN 9780945638001. ^ "Founder, six members of cult behind deadly 1995 Tokyo subway gas attack executed in Japan". NBC News. Retrieved July 6, 2018. ^ Lifton, Robert Jay (August 1, 2000). Destroying the World to Save It: Aum Shinrikyo, Apocalyptic Violence, and the New Global Terrorism. New York: Macmillan. ISBN 978-0-8050-6511-4. ^ Senate Government Affairs Permanent Subcommittee on Investigations (October 31, 1995). "III. Background of the Cult". Global Proliferation of Weapons of Mass Destruction: A Case Study on the Aum Shinrikyo. ^ Kristof, Nicholas D. "Japan Arrests No. 2 Leader of Sect Linked to Tokyo Attack". Retrieved July 6, 2018. ^ WATANABE, TERESA (May 16, 1995). "Japanese Guru Arrested in Fatal Subway Attack: Crime: Shoko Asahara found during raid on cult's Mt. Fuji compound. Warrant is first to link sect to poisoning". Los Angeles Times. ISSN 0458-3035. Retrieved July 6, 2018. ^ Alfred, Charlotte (March 20, 2015). "20 Years Ago, A Shadowy Cult Poisoned The Tokyo Subway". Huffington Post. Retrieved July 9, 2018. ^ Huffpost Society (May 12, 2015). "What is the "universality"? we should have learned from Aum Shinrikyo case after 20 years". The Huffington Post (in Japanese). ^ Koshimizu, Richard. "TOTAL INDEX PAGE of Aum Shinrikyo case" (in Japanese). ^ Ronczkowski, Michael R. (September 1, 2017). Terrorism and Organized Hate Crime: Intelligence Gathering, Analysis and Investigations, Fourth Edition. CRC Press. ISBN 9781351787123. ^ Ryall, Julian (January 16, 2014). "Justice looms for doomsday cult that brought death to the Tokyo subway". The Daily Telegraph. p. 14. Retrieved July 9, 2018. ^ Wijers-Hasegawa, Yumi (April 25, 2003). "Death demanded for Asahara". The Japan Times Online. ISSN 0447-5763. Retrieved July 9, 2018. ^ CNN, James Griffiths and Yoko Wakatsuki. "Shoko Asahara: Japan doomsday cult leader executed 23 years after Tokyo sarin attack". CNN. Retrieved July 9, 2018. ^ Wijers-Hasegawa, Yumi (March 14, 2003). "Asahara maintains his silence". The Japan Times. ^ "Aum founder Shoko Asahara was mentally competent during detention, sources maintain". The Japan Times. Kyodo. July 6, 2018. Retrieved July 7, 2018. ^ "Japan: Tokyo court rejects appeal by cult leader against death sentence". BBC News. March 27, 2006. ^ Hongo, Jun; Wijers-Hasegawa, Yumi (September 16, 2006). "Asahara's execution finalized". The Japan Times Online. ISSN 0447-5763. Retrieved July 9, 2018. ^ Ryall, Julian (November 21, 2011). "Japan rejects clemency appeal of last Aum Shinrikyo cult member". The Daily Telegraph. ISSN 0307-1235. Retrieved July 9, 2018. ^ Ramzy, Austin (July 5, 2018). "Japan Executes Cult Leader Behind 1995 Sarin Gas Subway Attack". The New York Times. Retrieved July 7, 2018. ^ Sturmer, Jake (July 6, 2018). "Japan's doomsday cult leader behind gas attack is executed". ABC News. Retrieved July 7, 2018. Asahara, Shoko (1988). Supreme Initiation: An Empirical Spiritual Science for the Supreme Truth. AUM USA Inc. ISBN 0-945638-00-0. —highlights the main stages of Yogic and Buddhist practice, comparing Yoga-sutra system by Patanjali and the Eightfold Noble Path from Buddhist tradition. Asahara, Shoko (1993). Life and Death. Shizuoka: Aum. ISBN 4-87142-072-8. —focuses on the process of Kundalini-Yoga, one of the stages in Aum's practice. Beckford, James A. (1998). "A Poisonous Cocktail? Aum Shinrikyo's Path to Violence". Nova Religio. 1 (2): 305–6. doi:10.1525/nr.1998.1.2.305. Berson, Tom (September 22, 1997). "Are We Ready for Chemical Warfare?". News World Communications. Brackett, D. W. (1996). Holy Terror: Armageddon in Tokyo. Weatherhill. ISBN 978-0-8348-0353-4. Kiyoyasu, Kitabatake (September 1, 1995). "Aum Shinrikyo: Society Begets an Aberration". Japan Quarterly. 42 (4): 376. Retrieved September 27, 2016. Murakami, Haruki; Birnbaum, Alfred; Gabriel, Philip (2001). Underground (1st ed.). New York: Vintage International. ISBN 978-0-375-72580-7.